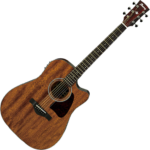 The Ibanez AW54CE electro-acoustic guitar is part of the Japanese brand’s Artwood lineup. This open pore guitar combines performance at a reasonable price, and a speck of class added for good measure. As a guitar under $300, the Ibanez AW54CE comes with a few surprises that will sweep you off your feet regardless of whether you are a beginner or a pro player. How surprising? Find out. The Ibanez AW54CE is a classic dreadnought with a cutaway. This electro-acoustic guitar stuns in dark brown open pore finish which gives it an elegant rustic look. At first glance, you can immediately tell that it is made of mahogany. It has a solid top, while the back and sides are laminated. Nevertheless, with its affordable price point, the mahogany top should be good enough to say that the guitar is an impressive option hardware-wise. Even the neck is made of mahogany and carries a classic rosewood fretboard. What makes the neck even better is the satin finish which makes fretting up and down smooth and subtle. Add to that the pretty tortoiseshell pickguard, you get a really nice-looking electro-acoustic guitar that is oozing with vintage appeal. But more than the good looks, it is important to look at how the Ibanez AW54CE fares in terms of sound and overall performance. Whether plugged or unplugged, the guitar boasts a rich tone, which is everything you would want for in an electro-acoustic guitar. The dreadnought body style and the solid mahogany top contribute a lot to the abundance of natural projection and resonance. The all-mahogany build makes the tone warmer, while the X-bracing keeping things more defined. Good looks and good sound — you think that is all? Nope. The Ibanez AW54CE is loaded with technology that helps both tone and performance become even better. When used with the Ibanez AEQ210TF preamp and Fishman Sonicore pickup, you get an onboard tuner and a 2-band equalizer to give more control over how the guitar talks. The headstock has six chrome die-cast Grover tuners and a bone nut and saddle on the rosewood bridge. The bridge carries pins that make string alterations much easier. In addition, this guitar comes with D’Addario EXP strings. It is a great experience to play the Ibanez AW54CE through an amp with the pickup system. A caveat though: the limited controls may restrict its performance a little bit. But overall, the Ibanez AW54CE delivers well in the sound department. The Verdict: Should You Buy Ibanez AW54CE? 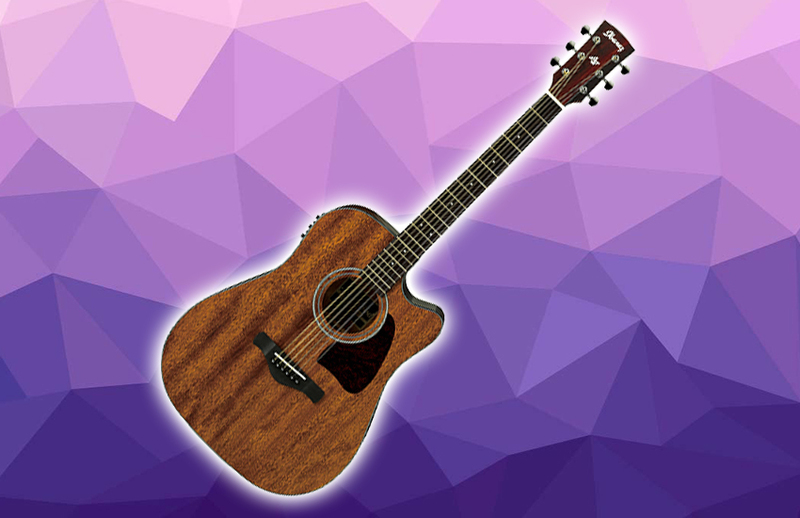 The Ibanez AW54CE has the aesthetic charm one could ever ask for in an electro-acoustic guitar. The impressive hardware and user-friendly electronics make it a must-have for both beginners and advanced players even more. Whether you want to use it for solo sessions or onstage performances, this guitar gets the job done at an affordable price. Classic-style dreadnaught with open pore natural finish, plus satin-coated neck, solid mahogany top, simple electronics, and quality tuners? I would never dare pass up to get my hands on this beaut.